I read this book mostly because I was pulled in by the title. You can’t help but give it a double take. Like Jesus as a jekyll and hyde scenario. But as I found out in reading the book, Jesus and Christ were born as twin brothers. Christ becomes the figure that follows Jesus around and transcribes all of his lectures, for “later use”. 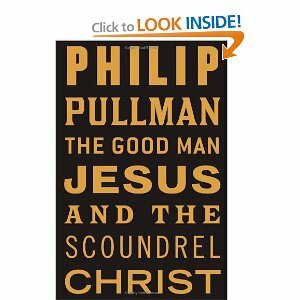 Pullman hits on the theme of writing history and writing truth. History is what happens from a literal standpoint, where truth tries to imply what the speaker (in this case Jesus) really meant, or what would better serve mankind in the future. Similar to the idea that the victor writes his own truth. So in a sense the propaganda or twisted truth, that would set up the christian church. In the novel, Christ is a real person, but is more so a metaphor for the christian church that sprang up after the death of Jesus. While young, Christ would talk to Jesus and say how his wise words would not be enough, and that he should consider getting leaders together to setup an organization to transmit Jesus’ teachings to millions of potential followers. Jesus was clearly against an organization being set up in his name, as he saw the potential for corruption and power issues. He said that the only church that would ever work would be one that would stay no more than a modest outpost for those that are in need. This fictional Jesus foresaw all of the bad that would come about from organized religion, which we now see in our own reality. The book progresses through all of the most notable scenes from Jesus in the actual bible and Christ ends up playing the role of Judas, as he kisses Jesus to seal his fate. 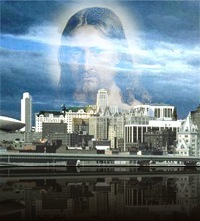 After Jesus has been crucified, his rising from the dead is pulled off with Jesus almost identical twin, Christ. Christ plays Jesus to Mary, as she believes that Jesus has risen from the dead. This is all orchestrated by a supposed angel that talks to Christ throughout the novel. Again this “angel” tells Christ about the virtues of telling the truth, over history. In a sense presenting such an air-tight version of Jesus’ life, in order to mythologize him and allow for people to believe without a reasonable doubt. Christ almost unwillingly goes along with the plot, to stage the ascension scene and feels that the inevitable rise of christianity is sealed as Jesus’ disciples fully believe that Jesus was the chosen one.